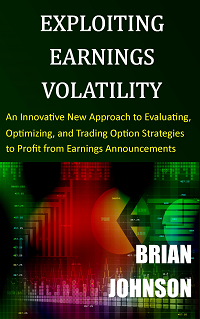 When you backtest systematic, rule-based strategies and your theory finally identifies a proven market inefficiency, you will face an interesting problem: which profitable trading strategy should you choose. Optimization tools test a number of strategies that are all based on the same premise, but have a wide range of parameter values. Ideally, many of the resulting strategies will be profitable, which is a nice problem to have, but it must still be addressed before you can trade the strategy. I struggled with this issue when I began developing systematic strategies, but I eventually had an epiphany: You don't have to choose. One type of strategy that has proven to be successful for many traders is to buy securities that are in a long-term uptrend, after they have suffered a short-term pullback. In theory, the long-term trend will prevail and your timely purchase will lead to high-probability reversals. I trade several of these strategies and would like to share the results from one of my strategies to demonstrate an alternative to choosing the "optimal" strategy. Before providing a specific example, we need to define a few terms. Profit factor is a metric used to quantify the profitability of a strategy over a given time period. Profit factor represents the total gains of the strategy divided by the absolute value (ABS) of the total losses. A profit factor of 1.0 would indicate a strategy that generates no profits or losses. A profit factor above 1.0 would indicate more gains than losses and a profit factor of less than 1.0 would indicate more losses than gains. If a strategy had a profit factor of 2.0, its cumulative gains would equal twice its cumulative losses. Obviously, we would prefer strategies with a high profit factor. That sounds great in theory, but how do you actually do this in practice? The answer, add a filter to your strategy. If the filter is consistent with the source of the market inefficiency, successively tightening the filter will gradually generate higher probability trades with greater upside and lower downside. Let's return to our earlier strategy example of buying securities that are in a long-term uptrend, after they have suffered a short-term pullback. I began with a set of rules to generate buy signals, then added one more filter that required the stochastic indicator to be below a specified level. The stochastic indicator is an oscillator that is often designed to predict market turning points by comparing the closing price of a security to its price range over a past user-defined period. The price range is determined by the highest high minus the lowest low during the period. The resulting values for the Stochastic indicator fall between zero and 100. If you are interested in the actual Stochastic formula, please see the Stochastic entry on Wikipedia. When the value of the Stochastic is low, the security is oversold (and likely to rebound). By adding a filter that required the value of the Stochastic to be below a specified level, I forced the original buy signals to meet one additional criteria. Some trades met the new criteria, others did not. In theory, as I lowered the maximum permissible value of the Stochastic, fewer signals would be generated, but they would be higher probability trades. Let's see how this worked in practice. 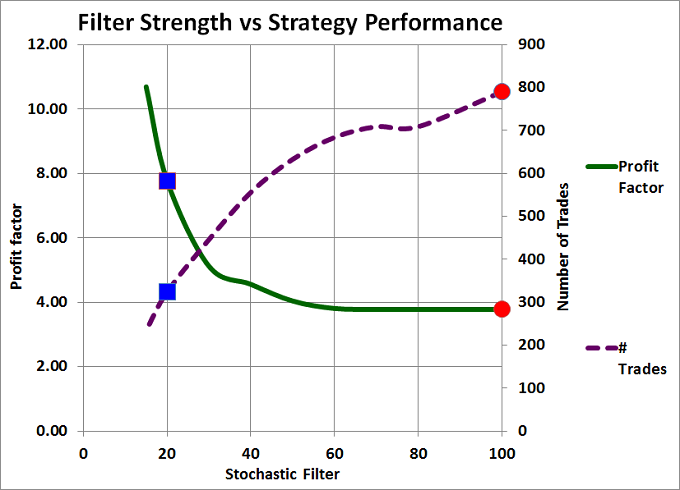 Figure 1 below is a graph of filter strength versus strategy performance. The maximum acceptable level of the Stochastic oscillator is depicted on the x-axis (horizontal). More restrictive values of the Stochastic are on the left side of the graph and less restrictive values of the Stochastic are on the right side of the graph. For each level of the Stochastic filter, two values are plotted. The profit factor is illustrated by the solid green line, which relates to the left vertical axis. The resulting number of strategy trades is shown by the dashed purple line, which relates to the right vertical axis. When the maximum value of the Stochastic was 100, the new Stochastic filter had no effect (since all stochastic values must be less than or equal to 100). The resulting strategy values are shown with red circles. 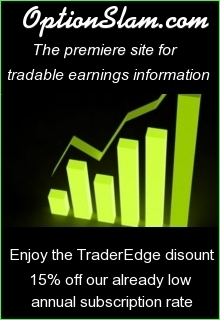 The original strategy had 790 trades and an attractive profit factor of 3.78. Cumulative gains were 3.78 times cumulative losses. Reducing the maximum value of the Stochastic from 100 to 60 had very little effect. However, as the maximum value of the Stochastic was lowered further (which tightened the filter), the profit factor increased significantly. As expected, the number of trades that passed the increasingly restrictive filter declined. The blue square illustrates the strategy results for a Stochastic filter level of 20. In other words, the maximum level of the Stochastic was 20 (and the trades still had to pass the original strategy rules). The resulting strategy generated only 324 trades, but the subset of trades had a profit factor of 7.77, doubling the original profit factor. 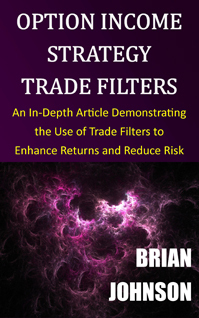 So, which strategy would you trade: the unfiltered strategy with a very attractive profit factor and more trades, or the filtered strategy with a remarkable profit factor, but fewer trades? The unfiltered strategy had a higher total profit, due to the larger number of trades. 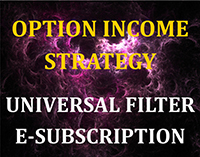 The filtered strategy had a much higher profit factor, but a lower total profit. Eventually I realized that I did not have to choose. I could trade both strategies by simply increasing the size of my transactions whenever the more restrictive conditions were satisfied. This would allow me to trade all of the original signals and further enhance the cumulative returns of the strategy by increasing my capital whenever the odds were overwhelmingly in my favor. However, in order to use this approach, the filter must be designed to exploit the hypothesized market inefficiency, not just fit the historical data. In addition, the profit factor graph should increase smoothly as the filter becomes more restrictive, and there should be a large number of representative trades - to avoid over-fitting the data. All of these conditions are satisfied in the above strategy. Finally, just because a profit factor of 7.77 is attractive does not mean that we can or should increase our risk above reasonable limits. Position sizing formulas should always be used to limit our risk. If you are unfamiliar with position sizing, please revisit my previous article titled "Stop Loss Orders Are Not Enough." 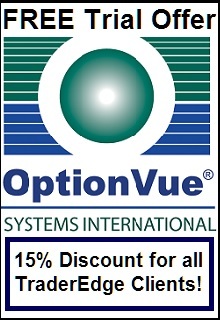 When developing systematic strategies, you do not need to limit yourself to trading a single "optimal" set of parameters. If your filters effectively exploit an identifiable market inefficiency, then it may be desirable to increase the size of your transactions as the quality of your signals improves. However, position sizing limits always apply. This entry was posted in Risk Management, Strategy Development, Technical Analysis and tagged optimization, position sizing, profit factor, risk management, strategy development. Bookmark the permalink. Interesting post – nice epiphany. Thanks for your comments. If I understand your question, you are interested in extending the concepts from the book to create a similar set of objective risk/return ratios for standard (non-option) trading strategies (e.g. trend following, rotational strategies, etc.) and using those tools to evaluate and manage those strategies. I would have to give that some additional thought. The ability to quantify both the risk and return of option income strategies is what makes the risk/return ratio framework possible. We would need to perform similar calculations on trading strategies to calculate similar measures. 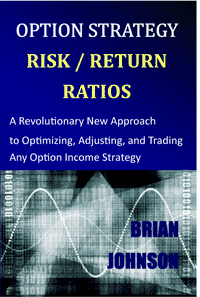 An interesting alternative (which might have been the purpose of your question) would be to use the risk return ratios as an objective ranking system to increase capital allocation to the option income strategies with the lowest level of risk per unit of return – subject to the standard position size constraints to prevent excessive levels of risk. This would be an excellent supplemental application of the risk/return ratios framework presented in the book. Thanks again Carl for sharing your insights.